We know one team who can't wait to get a break from Milwaukee's first baseman. Thames now has a major-league leading 11 home runs, eight of which have been hit off Cincinnati pitchers (or, entering Wednesday's games, more than any other player in MLB has hit all season). 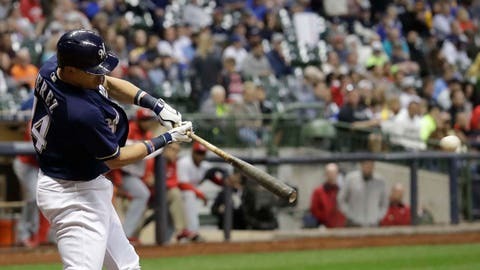 That is already the most homers for any Brewers player against the Reds in one season (Prince Fielder and Ryan Braun had the old record of seven). The most home runs for any Brewer against a single team in one year is nine by George Scott vs. Detroit in 1975. 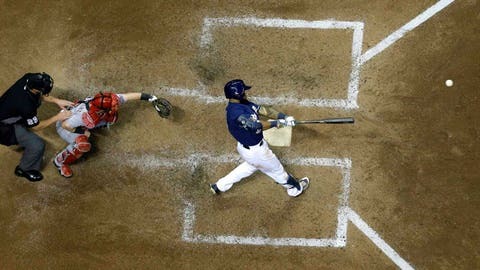 Oh by the way, Thames has the most homers ever hit by a Brewer in April and only five players have more home runs in any month (Fielder has the record of 13 in May 2007). 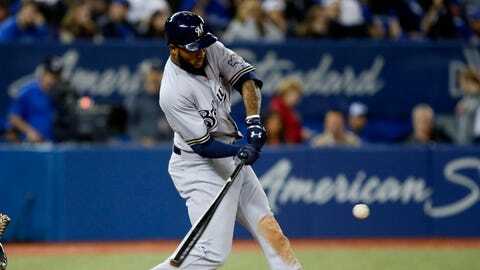 This past week, Thames had four of those home runs as well as eight runs, seven RBI and nine walks (good for a .261/.469/.783 slash line). Going out on a limb here, but we'd say this was a pretty good offseason signing by Milwaukee. It took Perez all of two games to have a good week. On Monday and Tuesday against the Reds, Perez went 5 for 7 with a double, two triples, two home runs, four runs and seven RBI. Those two games raised his season average from .179 to .261 and his slugging percentage from .308 to .609. With Lewis Brinson raking down in Triple-A, some Brewers fans are getting a bit anxious to see the prospect get called up to Milwaukee. 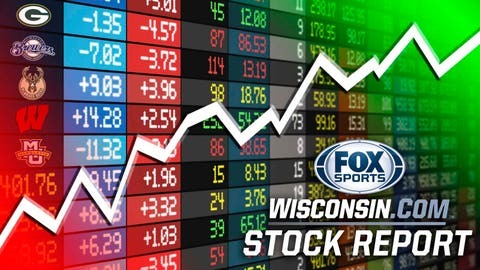 Keon Broxton recently broke out of a slump to perhaps quell some outfield fears, but now Santana is in a bad place, going 1 for 21 last week with nine strikeouts. The Bradley Center was as loud and raucous as it's ever been when Milwaukee hosted Toronto in Games 3 and 4 of their first-round playoff series last week. This did not go unnoticed by the Raptors, who expect a similar reception in Game 6. We're a little biased, but we'd love to see what Games 3 & 4 (and perhaps 6) would be like against Cleveland . . . 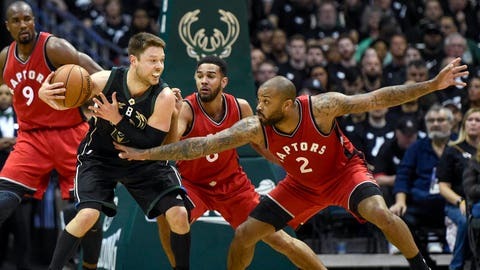 The Bucks center came off the bench in Game 3 against Toronto to post 16 points and seven rebounds, then followed that up with 14 points and nine rebounds in Game 4. "Moose" was a commanding presence in both games. 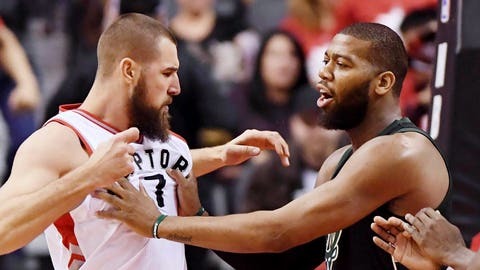 But Game 5 was a different story: 11 points, only two rebounds and Jonas Valanciunas got under his skin, with Monroe showing some frustration. 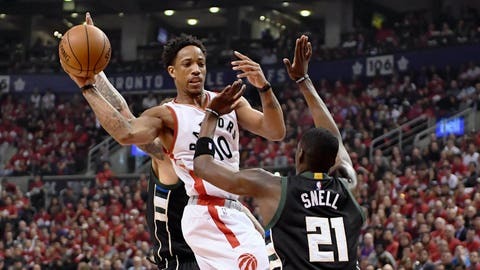 Snell helped shut down Raptors star DeMar DeRozan in Game 3 while playing 25 minutes. Toronto's shooting guard didn't make any field-goal attempts, with all of his eight points coming from the the free-throw line. In Game 4, Snell led the Bucks with a career-high 19 points, making 5 of 10 3-point shots. He continued to shoot well from downtown in a Game 5 loss, making 3 of 4 of his 3-point attempts. Delly is having kind of a rough postseason. 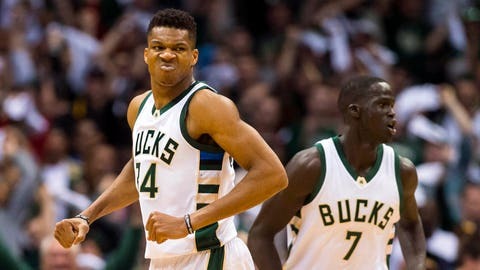 Although he had a good game on both ends of the floor in Game 3, the reserve guard for Milwaukee has scored only 16 combined points in the last three games with five turnovers. In Games 4 and 5, he is a combined 2-of-8 shooting from the field with six points.